The container ship E.R. Calais allided with pier in Port of Puerto Cortes, Honduras. The vessel arrived from New Orleans and was maneuvering for berthing, when the Master took command from the pilot and failed to reduce the dead inertia. 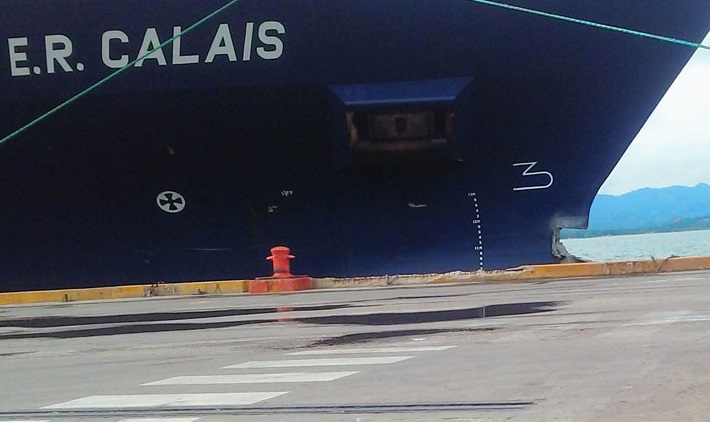 The container ship allided with the stone quay and suffered damages in the fore part. The vessel received large hole in the bow area, right above the bulb. Fortunately the damages was above the waterline and did not caused from for the vessel stability and seaworthiness. The ship remained afloat, but was ordered to return at anchorage until further repairs and authorities inspection. There were no injured people and water pollution during the accident. The pier was slightly damaged, but cargo handling operations at the port were no hampered. The Master of the container ship will be considered as responsible for the collision. The investigation for the root cause of the accident is under way. It is not yet clear what will be the delay of the container carrier from the current schedule. The container ship E.R. Calais (IMO: 9301445) has overall length of 210.00 m, moulded beam of 30.20 m and maximum draft of 10.00 m. The deadweight of the vessel is 34,263 DWT and the gross tonnage is 26,836 GRT. The ship is owned by the German company ER Schiffahrt and operating under the flag of Portugal.